Begin the award-winning Grey Wolves Series with the first three books: Prince of Wolves, Blood Rites, and *Just one Drop. 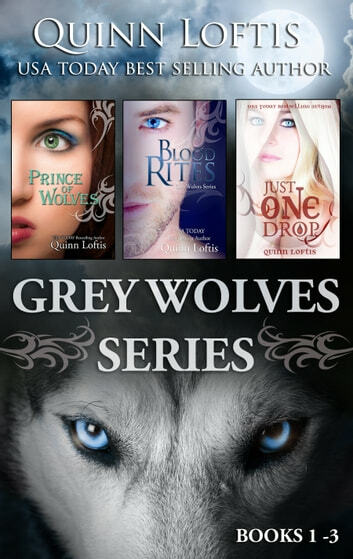 *The Grey Wolves Series follows the adventures of three high school seniors, Jacque, Jen, and Sally, as the girls are introduced to the hidden world of the Romanian grey wolves. The grey wolves' universe is populated with dominant Alpha male werewolves who slowly succumb to the darkness within them unless they find their true mates. It just so happens these three ladies are destined to become true mates to some of the most powerful males in the *Canis lupus *world. But destiny won't be fulfilled without a fight. Female *Canis lupus *are few and far between, and sinister dominant wolves will rise to challenge for the right to mate with these new, unique females. The ensuing chaos will undermine the strength of the packs, just when a new threat to the *Canis lupus *world emerges, one that can only be defeated by the strength that comes from the special union of true mates.